Writer-director Scott Derrickson is drawn to tales of the dark side. He first broke through in 2005 by spinning the peculiar story of Anneliese Michel into the horror-drama The Exorcism of Emily Rose. Since then he's contributed to the screenplay for Atom Egoyan's buzzed about West Memphis Three thriller Devil's Knot, and created the supernatural horror film Sinister, which follows a struggling true-crime novelist (Ethan Hawke), who rather than bringing his work home, makes his work home, moving his family into a house that's prior residence were horrifically murdered. While mining this tragedy for his next book, he uncovers some cryptic film roles that reveal a string of serial killings and indicate his family may be next. The film made it's world premiere at a secret screening at this year's SXSW festival, where critics praised its slow-burn style of suspense and satisfying scares. Unfortunately, the feature's first trailer disregards the former, falling into the horror marketing convention of stuffing the trailer with creepy imagery and jump scares. Check it out below! Even through the haze of clichéd sound effect stings, hard cuts, and ramped up action—meant to punctuate the trailer's chilling visuals—there's still clearly a terrifying tale unfolding here. It seems Derrickson has pulled inspiration from such horror standouts as The Shining, The Amityville Horror, The Ring and even Insidious to forge a frightening story that is all his own, complete with a villain whose gimmick is uniquely menacing to all movie fans watching from what no longer seems the safety of their home. 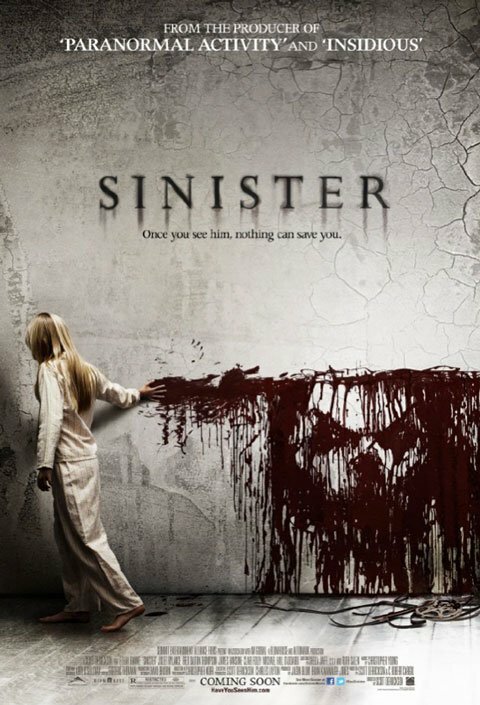 Sinister descends on theaters October 5th.